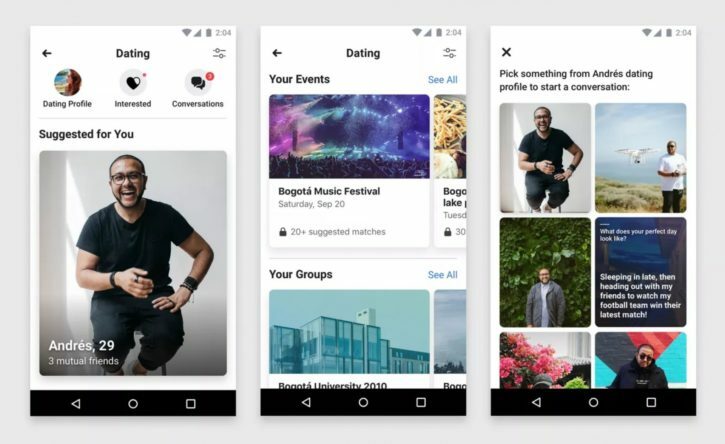 It was during the F8 2018 conference that Facebook announced its intention to enter the dating market with Facebook Dating: a new service directly integrated into the social network. According to Mark Zuckerberg, the goal is to allow the 200 million single users of the platform to find love. For now, since September 20, 2018, the service is being tested in Colombia. However, it will soon be available worldwide for all Facebook users over the age of 18. It will be enough to connect to his Facebook account, then create a profile “Facebook Dating” independent. Note that it will not be possible to meet people that we already have friends or blocked on the social network via this new tool. Information such as the user’s first name and age will be directly retrieved from the user’s account, but the user may complete his Facebook Dating profile with other information such as his measurements, his religion, his job, his interests or preferences in love. It will also be possible to add a maximum of nine photos. In order to connect the users of its platform, Facebook Dating will rely on the algorithms already used by the social network. Potential “matches” will be suggested based on several criteria: personal preferences, common interests, and common friends. A priori, only people living less than 100 kilometers away will be suggested. It will be possible to apply other additional filters. For example, users will be able to choose to search only nearby people, with or without children, and sort them by age group. It will also be possible to meet people who are registered in the same Facebook group or go to a common event, such as a music festival. Facebook Dating vs. Tinder: What Differences, What Benefits? Unlike apps like Tinder, Facebook Dating will not rely on a “swiping” system to scroll through user profiles. On the other hand, it will be possible to refine the suggestions by clicking on a button “I am not interested” on a recommended profile. According to Mark Zuckerberg, unlike its competitors, Facebook Dating does not aim to allow users to meet for one night stands, but to build real lasting relationships. For now, it’s difficult to predict whether Facebook Dating will succeed in dethroning Tinder and the other giants in the market. However, this new service has several assets to make it stand out. Its main strength is to be directly integrated with Facebook that more than 2 billion users use daily. Rather than having to build a whole profile, users will only have to “activate” the Dating feature on their Facebook profile. This is an advantage that simplifies the experience, and also creates a sense of trust for other users. Posted on December 6, 2018 December 6, 2018 by admin	This entry was posted in Dating Apps. Bookmark the permalink.